On Thursday night another Madison friend arrived in Madrid to visit for the weekend and see the city. He actually came from Norway, where he's TAing in one of the UW Mechanical Engineering's summer courses. I knew basically nothing about Norway, so I really enjoyed hearing about his experiences thus far while he was here. On Friday morning we headed to the center to see the main sites. By lunchtime we had visited the Sabatini Garden, Palacio Real, the Almudena Cathedral, Sol, Plaza Mayor, the Mercado San Miguel, Museo del jamón (where we had cañas and jamón), the mercado in La Latina, Taste of America (we stumbled upon the store and I had to take a look), and we sat in a park. Since I have seen each of these landmarks multiple times (and recently when Chad visited), I decided ahead of time to be on the lookout for small details or places I hadn't noticed before. By the end of the two-day visit I was quite pleased with the outcome of my personal challenge. In the Almudena Cathedral my find was a bench on the altar with baby angels seemingly holding up whoever sits down. It grabbed my attention, and in my numerous visits to this Cathedral I had never previously noticed it. Before he came, Jake had asked in an email if I was familiar with the restaurant Sobrino de Botin. It didn't ring a bell, but it's apparently known as the oldest restaurant in the world (1725), and it's right here in downtown Madrid near Plaza Mayor. So we found it that morning as we left the plaza. The display windows show its Guinness World Record and the various writers who used to frequent the restaurant (Hemingway, Fitzgerald, Benito Pérez Galdós, etc.). Between 14.30 and 15.00 we found ourselves in Lavapiés looking for lunch. 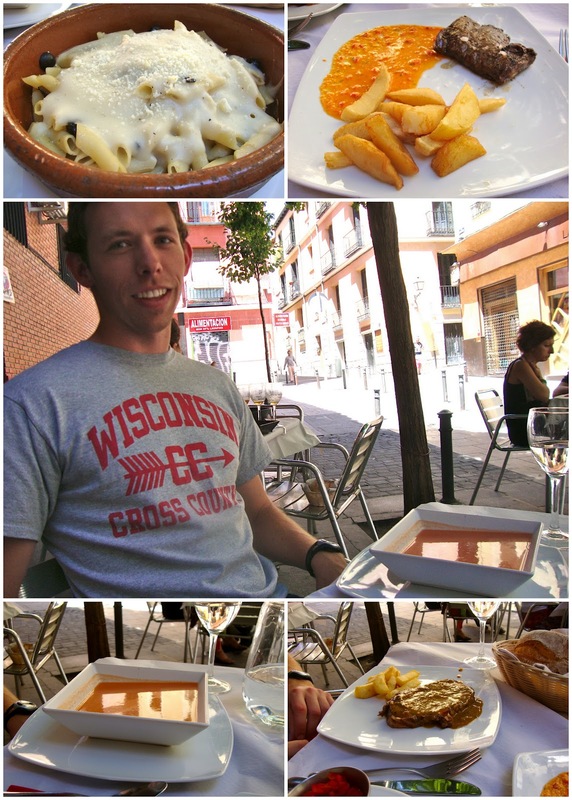 Those of you familiar with Madrid know that Lavapiés has tons of ethnic restaurants, but I wanted Jake to have a typical Spanish menú del día. After walking north past lots of Thai restaurants, I started to get worried that we'd reach Sol and be back in the touristy zone -- but then we found a gem. There were only Spaniards eating at the restaurant, and the menú del día was written in Spanish on a chalkboard (no paper slip for the menu of the day and no English): winner. We both had watermelon for dessert, then Jake had a café con leche. After lunch we walked east to Retiro Park; seeing Fuente de Neptuno, Plaza de Cibeles, and Puerta de Alcalá on the way. In Retiro Park we stopped at that same weird art exhibit that Chad and I had seen a few weeks earlier in the Palacio de Velázquez. This time the nearby Crystal Palace was open, so we went in and discovered part two of Nacho Criado's art exhibit. One of the pieces consisted of rows and rows of bottles with two televisions in the middle (showing footage of bottles), and alternating black and white signs along the outsides with the word "siglo" (century). Since there was nothing separating any of the exhibits from their viewers, I was paranoid that I'd trip and knock down all of the bottles. I wished there would have been some sort of explanation from the artist Nacho Criado, as I had no idea what he was going for in this piece (or the others...). Any ideas? At the duck pond just outside of the Crystal Palace, a rainbow could be seen in one of the water spouts. From Retiro we headed down Paseo de Prado, until this church caught our attention. It was right behind the Prado museum and I had never visited this church before, so we checked it out. It's from the sixteenth century and is called San Jerónimo el Real (St. Jerome Royal Church). We walked up to the entrance and peeked in, only to discover there was a wedding going on inside (hence the red carpet), so we didn't walk around inside. We finished walking down the Paseo de Prado and hopped in the metro at Atocha. When we got in the station, I immediately noticed the floors were covered in white dust, and the fire extinguisher box on the wall no longer had the extinguisher inside. From the eavesdropping I did, it sounded like some kids had broken the glass and sprayed the extinguisher; I don't think there had been a fire of any sort. Once back to Gregorio's apartment, we hung out a bit while deciding what to do for dinner. Gregorio suggested getting some drinks at a tapas bar he knew, which ended up having the best tapas (aka most food per drink) that I've had yet in Madrid. So good it's getting its own post. something about the mutability of time as another art medium?